Brig. 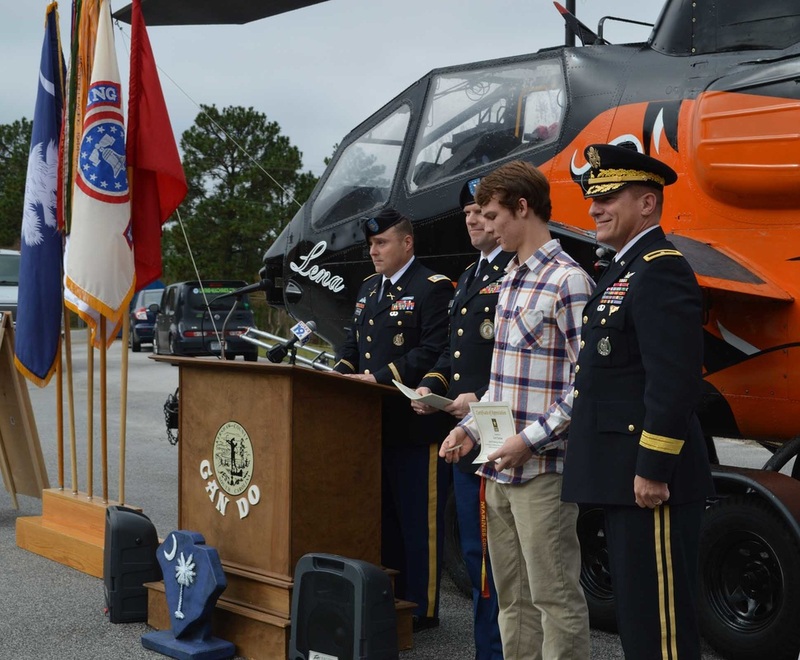 Gen. Kok gives a coin and certificate to Garrett Strunga, the student graphic artist who created the design for the AH-1F Cobra helicopter. The newest helicopter is named Lena in honor of Lena Horne the singer/actress. She worked a lot with the USO (United Service Organizations) during World War II. (Left of Strunga) Columbia Battalion Commander Lt. Col. Robert Garbarino and the Reserve Operations Office Lt. Anthony Loween. (Right) Brig. Gen. Troy Kok, USAREC DCG. Brig. Gen. Troy Kok, U.S. Army Recruiting Command deputy commanding general, unveiled the newest Celebrate Freedom Foundation (CFF) Helicopter in Columbia, South Carolina, Nov. 10. The Vietnam, Desert Storm and Bosnia combat helicopter was refurbished by 33 auto collision, welding, art and graphic design students at the Applied Technology Education Campus. The group spent more than 1,000 hours restoring the Army HA-1F Cobra for their fall semester project. "Working on this project allowed opportunities to reinforce STEM skills that are essential for working with auto collision repair technology today and tomorrow," said David Weaver, ATEC auto collision instructor. "The helicopter project reinforced skills needed to work on a modern aluminum intensive vehicle." Columbia Battalion is one of many battalions that’s partnered with CFF to bring out-of-commission aircraft and lesson plans to classrooms for teachers to use in STEM assignments. The CFF program educates young people about the Army and jobs opportunities after graduation. curriculums," said Jack Lovelady, CFF President. Kok presented each of the 33 students an achievement certificate. "This day is all about the students and the great work they have done," he said.